Nottingham Trent University have won two prestigious Green Apple awards for the development of urban gardens across the City site and energy saving in the new Pavilion at Clifton. Nottingham Trent University have received two prestigious Green Apple awards in a ceremony held at The Crystal in London, one of the most sustainable buildings in the UK. A gold award was given to our 'Greening the City' project which aims to create a green corridor through our City site, linking the Arboretum with the city centre. We also received a bronze award for the Clifton Pavilion in recognition for its energy saving credentials. The Greening the City project was born from student requests to have better outdoor spaces to study and relax on the city site, which is in Nottingham city centre. Of the eleven sites identified for improvement, two have already been completed. 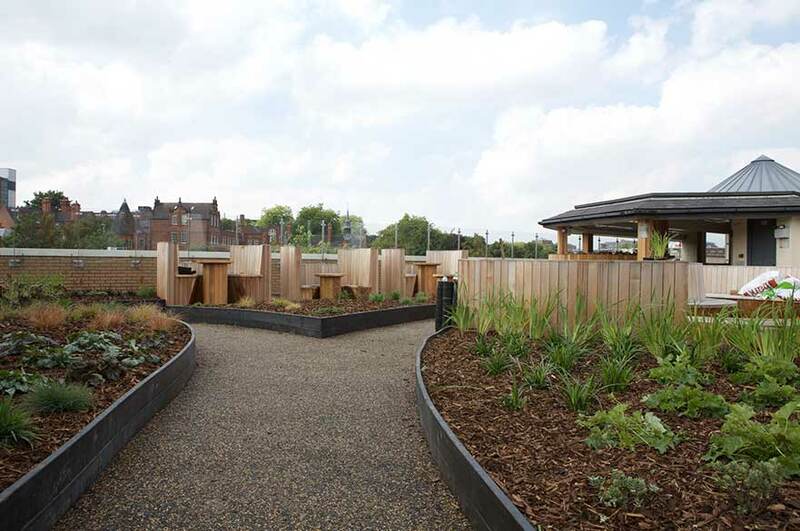 The Boots Library roof garden, designed by NTU Horticulture students, offers a space for students to take time out from the hustle and bustle of University life. It is Wi-Fi enabled to allow students to study in the sunshine and has a covered area if the weather is inclement. The Dryden Corner garden has transformed an unattractive patch of land into a destination for lunch, relaxing with a book, or meeting up with friends. The garden, designed by NTU alumnus and Chelsea Flower Show Gold winner Jackie Setchfield, has proved to be popular with staff, students and passers-by. Both gardens incorporate planting to enhance biodiversity on campus, with insect-friendly trees and flowers, and have plenty of seating to allow students to use the spaces for group work, quiet reading or socialising. The Pavilion at Clifton Campus is one of the first buildings in the Higher Education sector to generate more electricity than it consumes – a truly carbon negative building! The project saw the demolition and refurbishment of large parts of the University's George Eliot building and transforming it into a space that is bright, airy and offers flexibility of use for teaching, collaborating and socialising. The bronze award recognises the achievement of creating a sustainable building that has set a new benchmark for future development at the University. NTU was the only university to receive an award, with other winners coming from the world of architecture and industry including Kier Construction, Wessex Water and Aldi.